OMGPOP's Pictionary-inspired social drawing title Draw Something is now the most played game on Facebook. According to stats from tracking service AppData, the game is racking-up 10.8m daily users, comfortably beating its closest challenger Zynga's Words With Friends, which has 8.6m every day. 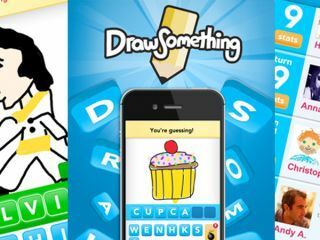 Draw Something's social networking success follows its sharp rise to the top of the iOS and Android charts after hitting 20 million downloads just five weeks after it was released. The duality of its success on mobile and Facebook has arisen largely through allowing cross-platform challenges, during which users have to guess their pals' touchscreen drawings. Just like Words With Friends and the official Scrabble game it pinched took inspiration from, iPhone players can take-on Facebook friends and vise-versa. The exceptional success of Words With Friends and Draw Something do prove one thing; time tested games like Scrabble and Pictionary are still massive winners even though we rarely sit around and play the physical games. Hooray for the 21st century mediums keeping them alive and kicking. For Zynga, for so long the kingpin of the Facebook gaming arena, through titles like WWF, Farmville and Zynga Poker, its dethroning raises further questions about its long-term future on the social network. The company recently announced its own gaming portal, which will go head-to-head with Facebook and also encourage third party developers to submit their own titles.